Forest edges, wooded areas near permanent or temporary waters. Near street lamps and lighted buildings at night. Unknown. Probably 5 to 7 years. 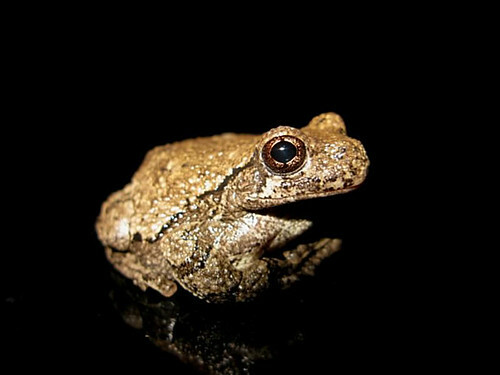 This is a small, solitary, nocturnal frog. It is 1¼″ to 2⅜″ long at maturity. Females are larger than males. The upper (dorsal) surface is warty. There are usually dark blotches outlined in black. The background color can change in seconds from green, light grayish-green, gray, brown, or dark brown. The color is determined by the color of the background, the season, and the humidity. It is most often some shade of gray. There is usually a large, irregular, dark blotch on the back. Beneath each eye there is a large spot, white and prominent on males, olive and less noticeable on females. The belly is white. On females the chin is pale olive-gray. On males the chin is darker gray. The toes end in large adhesive pads. On males, the lower (ventral) side of the hind legs is bright yellow or yellowish-orange. 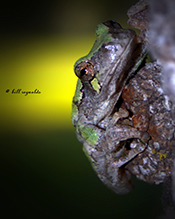 Cope’s gray treefrog (Hyla chrysoscelis) is almost indistinguishable morphologically. The dorsal surface is not as rough and is more often unblotched. If blotched, the blotches are often not outlined in black. The only reliable ways to distinguish between the two species is by listening to their calls or examining their chromosomes under a microscope. 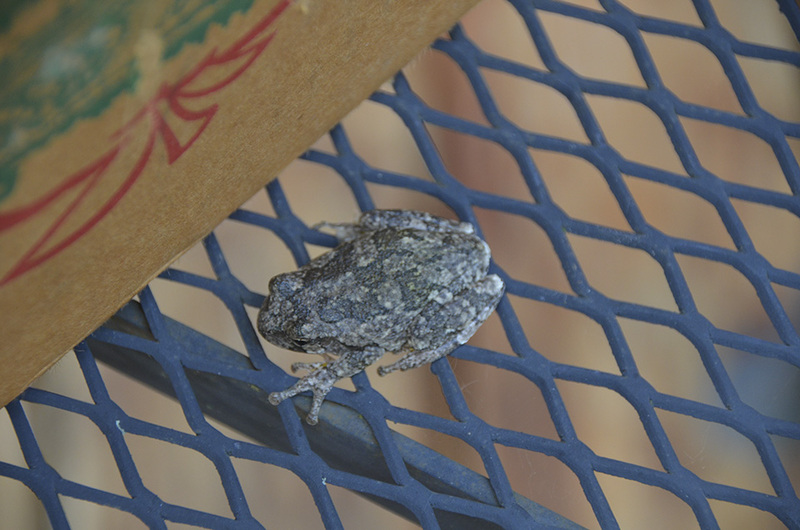 The call of Cope's gray treefrog is a faster trill with about twice as many notes. They prefer more open habitats, including prairies and savannas. Algae, material from dead and decaying plants and animals (detritus). 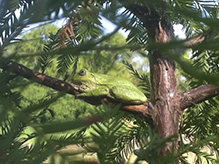 Insects, insect larvae, mites, spiders, plant lice, harvestmen, snails, and smaller frogs. 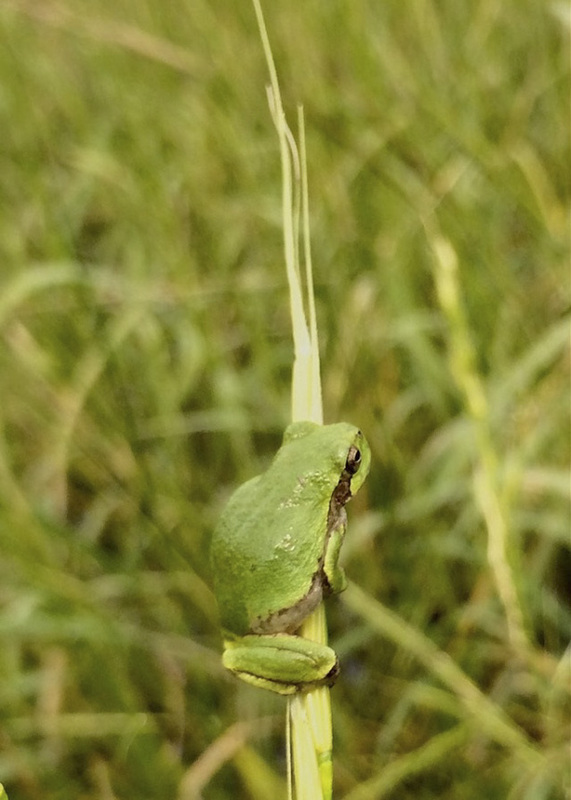 Breeding occurs from April to July, peaking in May to June. 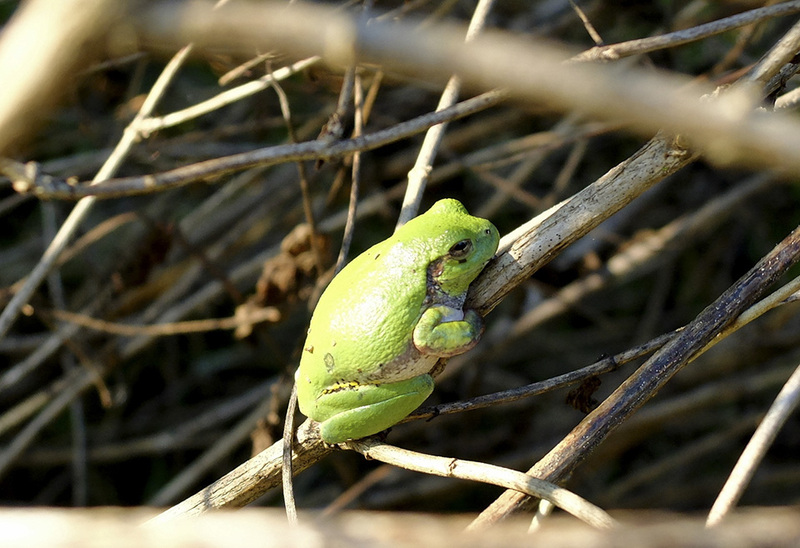 After breeding, the female will deposit 450 to 600 packets of 30 to 40 eggs each on emergent vegetation at the surface of a shallow pond or a permanent or temporary pool. The eggs hatch in about three weeks and metamorphosis occurs about four weeks later. 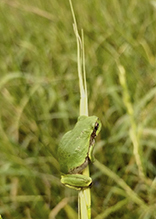 The tadpole is about 2″ long preceding metamorphosis. Adults live 5 to 7 years. They overwinter under the shelter of a log, rock, bark, or leaf litter. They are freeze tolerant and can survive multiple freeze-thaw cycles. Glycerine is produced preventing the formation of ice crystals in vital organs. 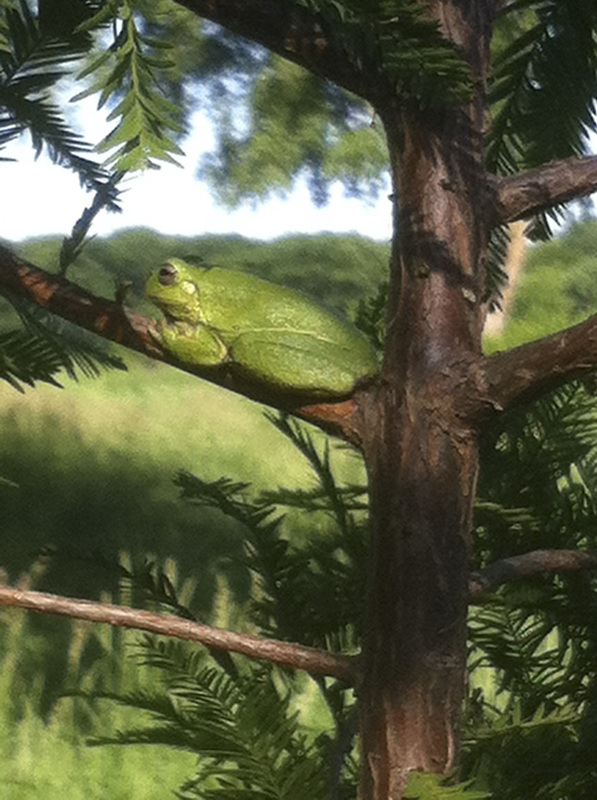 Adults are usually found high in trees, on mossy or lichen-covered fences, or sometimes in abandoned bird houses. They are rarely found on the ground except in breeding season. During breeding season the adult’s background color is usually green. Sources: 11, 12, 13, 14, 24, 29, 73. 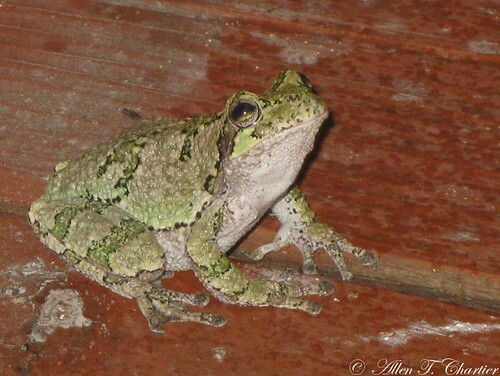 Gray treefrog and Cope’s gray treefrog were, until 1968, considered the same species. Did you ever want to know what a Gray treefrog (Hyla versicolor) sounds like? I have not seen any tree frogs this year and few last year. Almost no bats last year and this year. I live in a tree forest.